I made this again last night. Delicious as always but I was unable to get the same smoked sausage I normally use so it was lacking that nice smokey flavor. My solution, I added smoked paprika and my Cajun House Seasoning at the end. SO good! Also, be sure to add the pepper vinegar, it really brings out all the flavors! 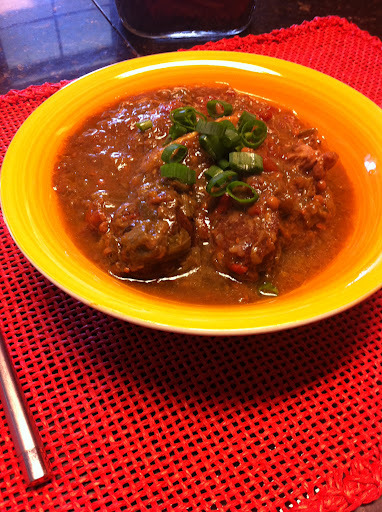 This is recipe is one of many Slow Cooker Recipes in my first cookbook, Satisfying Eats. I also have more NEW Slow Cooker dishes coming out in my new cookbook, Comforting Eats, due out 11-11-14! Here on the bayou, everyone adds their own touch to the family recipe to make their gumbo a little unique. Most gumbos start off with making a roux (pronounced “roo”) which means browning equal parts of oil (or butter) and flour. This is a very tedious process that takes practice to master without burning. This recipe for gumbo is roux-less that I learned from our neighbors, the Fontenot’s here in Baton Rouge. 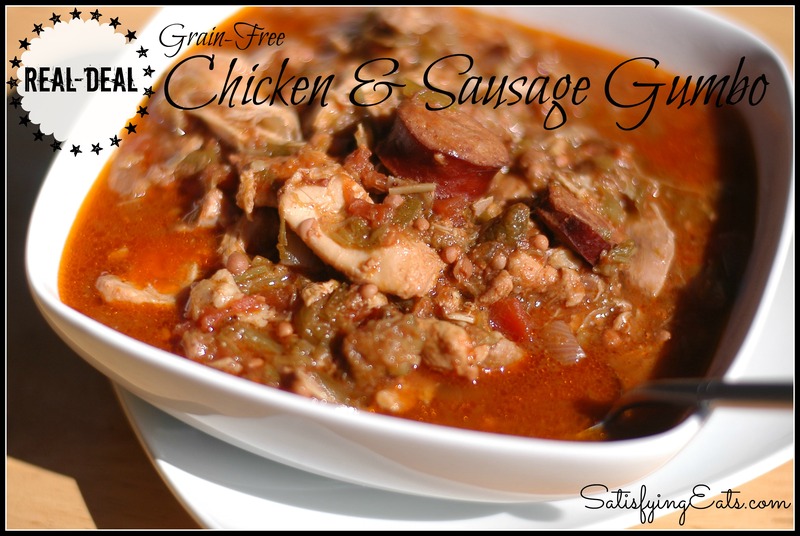 It has 2 secret ingredients that make it flavorful and thick like a great gumbo should be, smoked sausage and okra. Yes, yes, I said okra. I was never a fan of the stuff growing up unless my dad sliced, breaded and fried it. He would always boil some and eat it and I was completely grossed out because of the texture. So when I first heard there was okra in our neighbor’s gumbo, I was skeptical. But something was different about this okra gumbo. It was cooked down until the usual boiled okra texture was gone and the gumbo was great! This method requires one pot to cook okra and tomatoes down until all the “slime” is gone. While this is cooking, another pot is used to prepare the chicken stock, chicken and sausage. Then you marry the two pots together and it is a happy ending! While making it this past weekend, I wondered how it would work in a crock pot so I wouldn’t have to stand over the okra and tomatoes, just like you do a roux. It worked and it’s genius!! Please don’t let the simplicity of this recipe keep you from trying it. 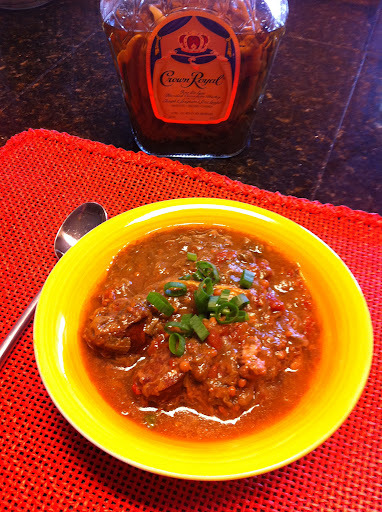 Just make sure you get a flavorful smoked sausage and you will have a winning crock pot of gumbo! For those who don’t like okra, you must give this a try. Because it cooks so long, you don’t have any of the slime and you can’t tell the okra is in the gumbo. You start off at night with your okra and tomatoes in your crock pot, then finish it in the morning by adding your onions, chicken, sausage and broth. Then when you get home, you have a masterpiece for dinner! I have been using my Crock Pot A LOT! I just purchased THIS programmable one and I LOVE IT! Also, don’t worry, I haven’t taken up drinking. The Crown Royal bottle contains peppers in vinegar that our neighbor grew and gave us. This gumbo is made even better finished off with a splash at the end and some chopped green onions. If you need additional flavor and heat, your favorite hot sauce will do. Right before going to bed, place okra and tomatoes and 1 cup of chicken broth in crock pot and stir. Before going to work in the morning (or 6-8 hours later), add sausage, chicken thighs and seasoning blend. Stir. Cover and continue to cook on low until you get home (or 6-8 hours). If you use good smoked sausage, you will not need to add any additional seasonings. Finish off with chopped green onions, a splash of pepper vinegar and/or a dash of Cajun House Seasoning. Place all ingredients in slow cooker and cook on high for 4-6 hours or low for 10 hours. Some of the links contained in this post are Affiliate Links. If you make a purchase through the links provided, I will receive a small (very small) commission which I will use to buy more ingredients to create more recipes. This is at NO cost to you! I have chosen these products not to receive a commission, but because I think they are the best on the market. These are ingredients and equipment that I actually use. 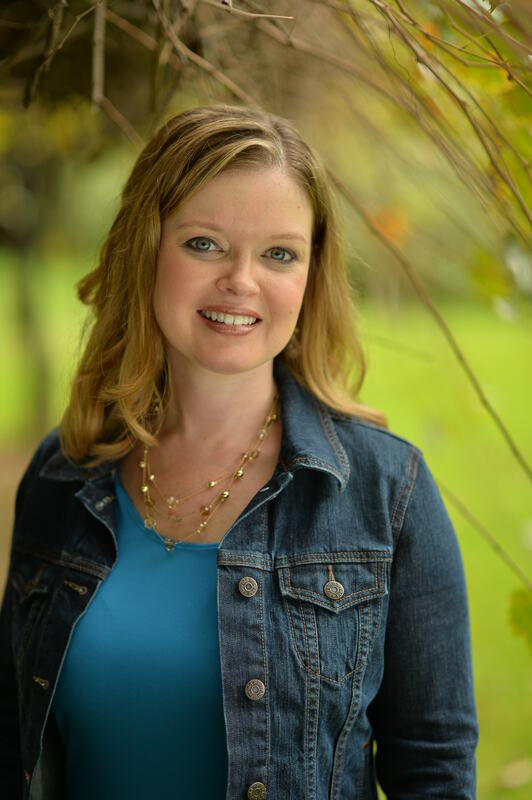 This commission helps compensate me for my time, and justifies the hours each day that I spend in the kitchen creating recipes, on the computer posting blogs, and sharing helpful information with you. « Breakfast or Dessert Waffles?!?! I made this the other night although I was very hesitant. No one in my family eats okra. After cooking the okra and tomatoes, I was worried that they didn't cook down enough. Much to my surprise, at the end of the day, I had a very tasty gumbo with no visible signs of okra. I used shrimp instead of chicken and waited until the last minute to throw these in. We ate this over "rice" and it was the first time my husband has ever eaten cauliflower. I can't wait to try another recipe! This meal is delicious! I will definitely be making this again. question … i notice you put one can of stock in with the okra … do the other 2 cans go in with the chicken and sausage in the morning ? I cant see where it says to add the rest of the chicken stock. thanks !!! Sounds yummy ! What is the seasoning blend? What ratio of these things? Thanks! Hi Misty. Seasoning blend is a mixture of onions, bell pepper, celery and sometimes parsley. Using 1 small onion, 1/2 bell pepper and 1 stalk of celery should work. The more veggies, the better! I am a cajun or at least a transplant cajun. I’ve lived all my life (40+) but the first year here on bayou Lafourche. Learned to cook like the cajuns here so going gluten free a little more than 3 weeks ago has been quite an adjustment for me and my family. Gumbo is the cajun word for okra so a gumbo literally means okra. When someone says they made a gumbo it can mean so many different things depending on what part of South Louisiana they are from. There are creole cajuns from New Orleans, Acadian cajuns from the Lafayette area and bayou cajuns. I consider myself a bayou cajun. We do make gumbo with a roux and we make a rouxless gumbo with okra, which we call okra gumbo. I always thought it was funny because that means okra okra. Although my family prefers the okra gumbo that you have to cook down, it is so time consuming! I made this for our Sunday meal and I LOVED it. Thanks so much for this recipe I will definitely be making it again! That is great to hear Melissa! Thanks for the back ground… so I guess this is Okra, Okra! 😉 Yeah, my neighbor (whom I consider Cajun) made something simular to this on the stove top and I thought “How time consuming”! Slow Cooker to the rescue! Glad everyone enjoyed it! Delicious!!!!! Reg sausage and seasonings!!! My son and hubby loved too!!!! A keeper!! Gosh I love slow cooker recipes like this with 2 kids!! What is your favorite smoked sausage? Barbara, my favorite is a smoked deer sausage I get from a local meat market. I live in Louisiana so we have so many different kinds. Unfortunate, the ones in the store are usually filled with horrible ingredients! I hope you can find a good one!